There's nothing like consumer electronics to get you into the holiday spirit. So to get into the mood I did a couple of segments on LIVE with Regis & Kelly on Tuesday (December 4). For folks looking for a complete rundown on the products and gift ideas, I'll be posting a complete list at J-Q.com this week, including items we missed because the show was heavy (Turtle Beach Ear Force headphones that Kelly really liked and Guitar Hero III, which I was going to play for them, honest). To kick out the show, the R, K, and JQ trio played "Mississippi Queen" on Rock Band with Regis on drums, Kelly on vocals (she knows all the lyrics! ), and your's truly on lead guitar. I was the one who didn't need a wig. 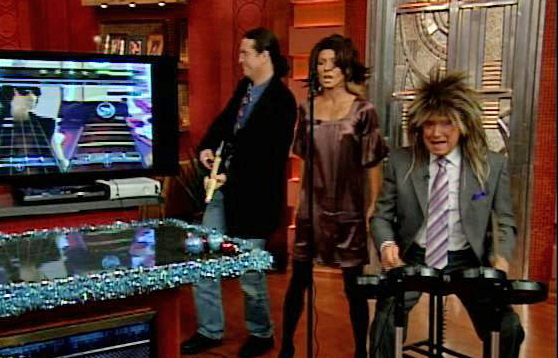 This entry was posted in Uncategorized and tagged jq, pioneer, regis & kelly, rock band. Bookmark the permalink.